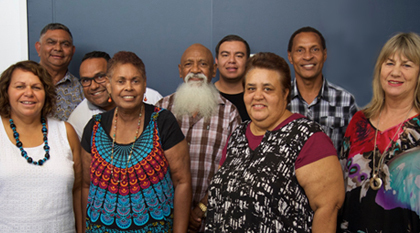 The ACC Indigenous Initiative is committed to create awareness and engage with the Indigenous people of our nation, by resourcing churches and leaders, and raising up Aboriginal and Torres Strait leaders. Each year NAIDOC Week is an amazing opportunity for Australians to celebrate our nations Aboriginal and Torres Strait Islander culture, history and achievements. The origins of NAIDOC Week can be traced to the emergence of Aboriginal Church Leaders in the 1920s which sought to increase awareness in the wider community of the status and treatment of Indigenous Australians. The ACC is committed to working towards the goal of becoming an inclusive movement of churches which fully embraces both indigenous and non-indigenous people alike. NAIDOC is a great opportunity and open door to form connections, to learn and celebrate as we work together towards this goal. There are many celebrations and activities that take place across Australia during NAIDOC week that you and your church can participate. CLICK HERE to find events in your local area. 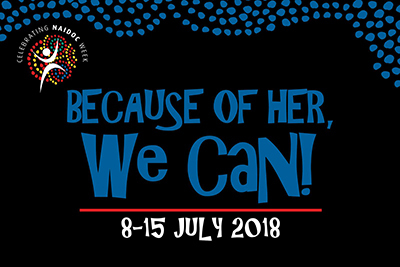 The theme of NAIDOC this year is “Because of Her, We Can!” – celebrating the significant contribution indigenous women make within our communities. This NAIDOC week, consider ways you and your church can honour the amazing indigenous women in your churches and communities. Use this time as an opportunity to learn about NAIDOC week and the work and achievements of indigenous leaders within the ACC movement. Watch the video as members of ACC’s Indigenous Initiative share about NAIDOC week and encourage us all to get involved. In 2018, the ACC National Indigenous Conference will be focused on young Indigenous and non-Indigenous emerging leaders. 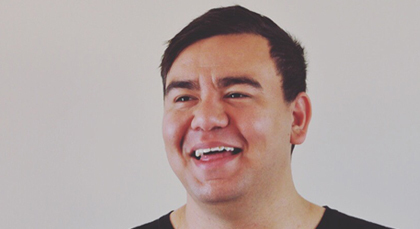 In 2018, the ACC National Indigenous Conference will be focused on young Indigenous and non-Indigenous emerging leaders who have a shared identity in Christ and culture. The theme is ‘Juriga’ with the vision for strong relationships, culture, partnerships and strong communities. We’re very excited about next week in Melbourne! Things are really stepping up a notch with the upcoming ACC National Indigenous Conference in Melbourne and we’ve got lots to share with you. You can register at the door. On the first day of the conference at 5.30pm, we are holding an amazing welcome dinner, so be early. Straight after a time of catching up with old friends and making new ones, we will be welcomed by the traditional owners of the land, and have the privilege of hearing some of our wonderful speakers, includinding the Vice President of the ACC – Pastor Alun Davies alongside our National Indigenous team. 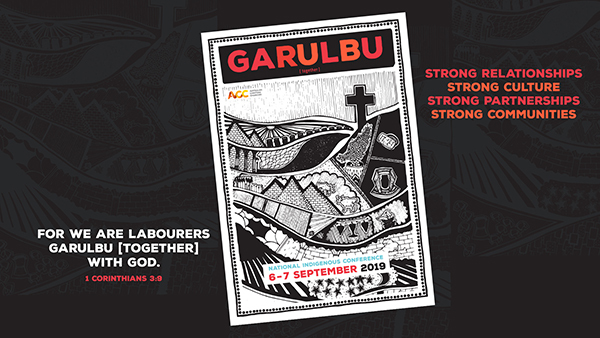 The conference, is structured around the theme ’FAVOUR’, and will draw together everyday Aussies, church leaders, cultural and collecting institutions, the corporate sector and Indigenous organisations and communities. It will examine and share how we together can more effectively target efforts to achieve great God inspired outcomes and practices that will have lasting impacts through transformative change. Look forward to seeing you all in Melbourne. NAIDOC stands for National Aborigines and Islanders Day Observance Committee. Its origins can be traced to the emergence of Aboriginal Church Leaders in the 1920s which sought to increase awareness in the wider community of the status and treatment of Indigenous Australians. NAIDOC Week is held in the first full week of July. It is a time to celebrate Aboriginal and Torres Strait Islander history, culture and achievements and is an opportunity for the church to be involved in their local communities and to recognise the contributions that Indigenous Australians make to our country and our society. Every Year NAIDOC has a theme that our communities work towards. The 2017 theme – Our Languages Matter – aims to emphasise and celebrate the unique and essential role that Indigenous languages play in cultural identity, linking people to their land and water and in the transmission of Aboriginal and Torres Strait Islander history, spirituality and rites, through story and song. The ACC National Indigenous Initiative encourage all Australian churches to participate in the celebrations and activities that take place across the nation during NAIDOC Week. Australians Together is a not-for-profit organisation passionate about ending the disconnect between Indigenous and non-Indigenous Australians through respectful relationships and connections.  Australians Together runs awareness raising, training and partnership initiatives with churches, the education sector, workplaces and the general public. These initiatives help Australians understand our shared story, explore culture and identity and encourage people to discover everyday actions they can take that contribute to a better future for all Australians. 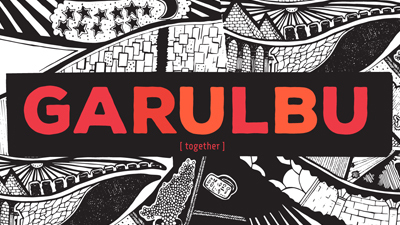 We are excited to announce that the theme for the 2019 ACC Indigenous Conference is ‘GARULBU’ (meaning ‘Together’). It is all about strong relationships, strong culture, strong partnerships and strong communities. This annual event is strategically positioned to promote cross-cultural ministry and partnerships, whilst raising awareness for Indigenous culture. 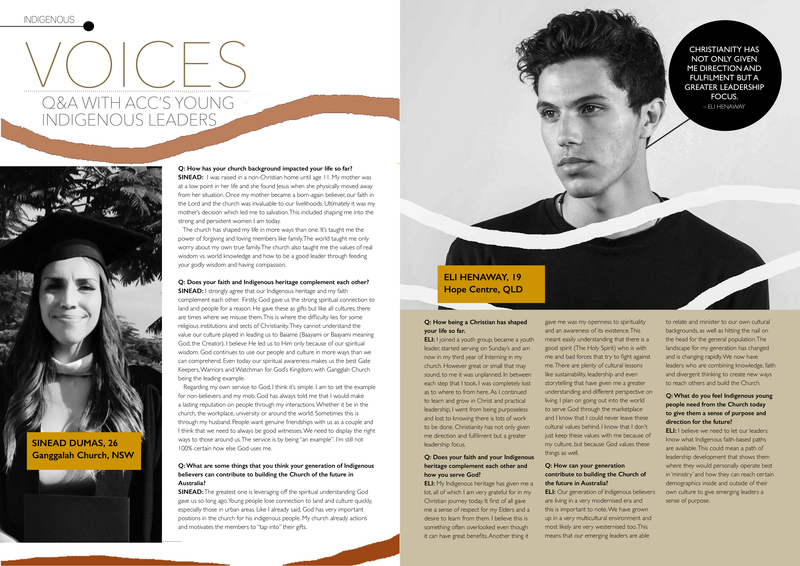 The latest edition of the ACC Emag features Q&As with four young Indigenous leaders, who share their hearts for ministry and their culture. NAIDOC Week – celebrating our national Aboriginal and Torres Strait Islander culture, history and achievements. Members of ACC’s Indigenous Initiative have made a video that share more about NAIDOC Week and the heart of the Indigenous leaders. ATTENDING LOCAL NAIDOC EVENTS: Click here to find events in your local area. CELEBRATING INDIGENOUS WOMEN: The 2018 theme is “Because of Her, We Can!” which is a great opportunity to honour and celebrate the amazing indigenous women in your churches and communities. LEARNING MORE: NAIDOC week is an opportunity to learn more about the work and achievements of indigenous leaders within the ACC movement. Watch the video as members of ACC’s Indigenous Initiative share about NAIDOC week and encourage us all to get involved. 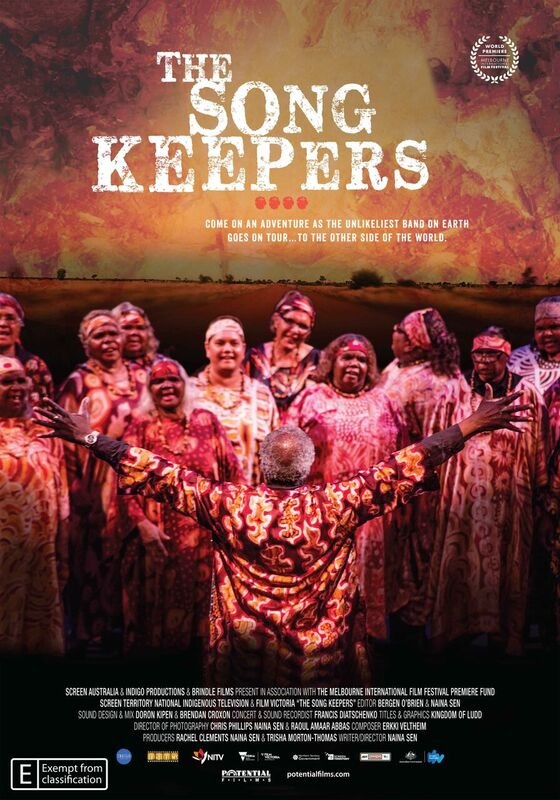 The Song Keepers is a remarkable and beautiful film about the Central Australian Aboriginal Women’s Choir as they embark on a historic journey to take back the hymns that were given to their ancestors by the German missionaries but in their own ancient Aboriginal languages and on their own terms. In the churches of remote Central Australia, a 140-year musical legacy of ancient Aboriginal languages, German sacred hymns and baroque music is being preserved by four generations of song women that make up the Central Australian Aboriginal Women’s Choir. With the charismatic musical director Morris Stuart, the choir embarks on an historical tour of Germany, singing the baroque Lutheran hymns – brought to Australia by missionaries – in their own Western Arrarnta and Pitjantjatjara languages. The Song Keepers premiered at the Melbourne International Film Festival in 2017 and is due for release across selected cinemas across Australia. 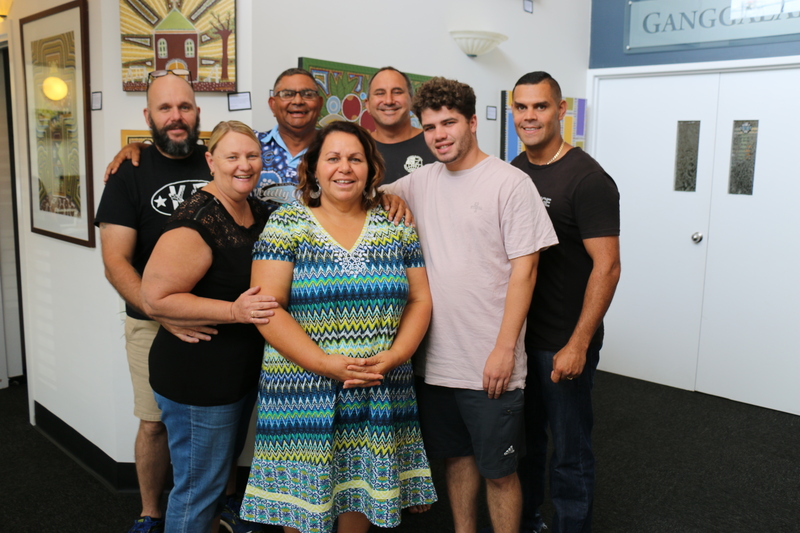 Seven Indigenous leaders recently undertook the Ministry Chaplaincy Upgrade course held at Ganggalah Church in Tweed Heads. This three-day course is aimed at Pastors and Leaders who have had significant pastoral leadership experience but are wanting to move further into the community by offering themselves as Chaplains. The training was offered by Alphacrucis College (AC) in partnership with Chaplaincy Australia (CA). 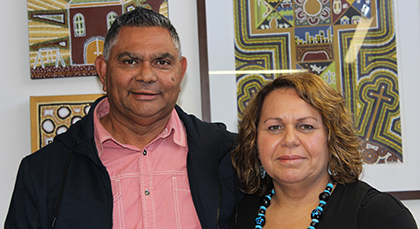 Scholarships were made available for Indigenous leaders, following a special offering at the NSW State Conference. This incredible partnership has bought about an amazing growth in the potential to impact Indigenous communities across NSW. Chaplains will be able to connect with individuals who are outside the reach of the Church and they can minister care, support and assistance to individuals who are facing incredible moments of need. The Ministers Chaplaincy Upgrade course is a new initiative from AC & CA and fits into their suite of courses to equip people to enter into effective Chaplaincy Ministry. Every month more and more people are stepping up to take on the ministry of Chaplaincy. Churches across the country are finding the benefit of have one or more Chaplains attached to the ministry of their church. These chaplains gain access to places that the church has not been traditionally able to reach. They impact people at their point of need and help the church connect with their community in meaningful and responsive ways. Many pastors and senior leaders are interested in migrating their ministries towards Chaplaincy or at least adding it to the mix, but up until now it has required the completion of a Cert IV or Diploma in order to become accredited. This new course is a great option because it gives leaders (who have had significant Pastoral experience) the opportunity to gain the training required to move into this great ministry. The training is delivered by Senior Chaplaincy Leaders over a three-day intensive and on completion of the course work, you can gain accreditation with Chaplaincy Australia. At $600, this course is an incredibly cost effective way to up skill yourself into this great ministry. Over the next year there will be various opportunities around the country to take part in this great course. Chaplaincy Australia wants to see at least one Chaplain attached to every ACC church across the country. Let’s follow the lead of our awesome indigenous leaders and get ready to make the difference that the Lord has for us! Invitation to the opening night of the Marmung – Lift Him Up exhibition. 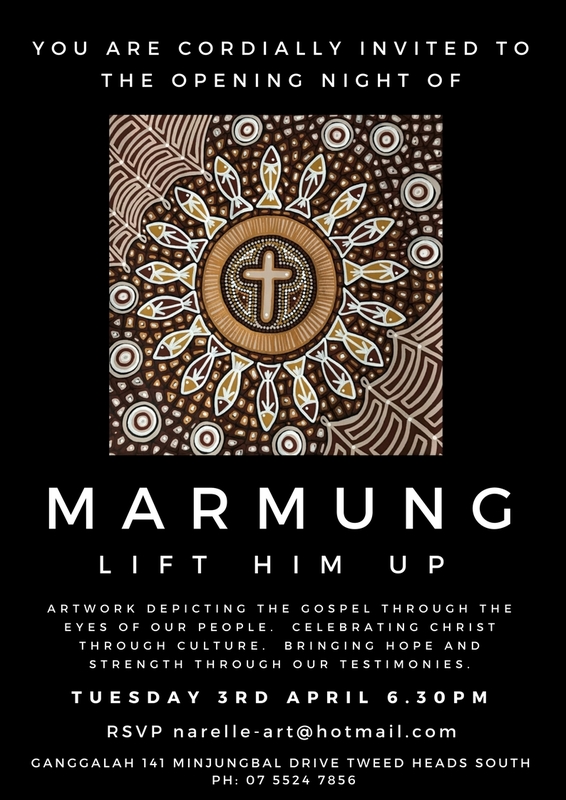 You are invited to the opening night of the Marmung – Lift Him Up exhibition, with artwork depicting the Gospel through the eyes of our people. The official opening of Ganggalah’s new facilities on 9th December 2017 was a milestone in their forty year history in the Tweed Heads community. Today they have a multi-functional building that is home to Ganggalah Church, Ganggalah Aboriginal Arts and the Ganggalah Training Centre. 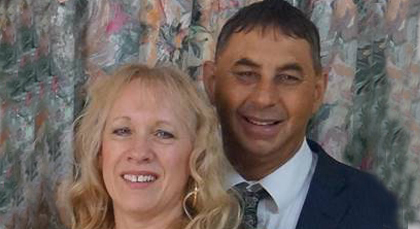 Pastors Alan & Amelia Watego planted a kids Church at Carool, an outer Banana farming area in the Tweed region, and eventually moved into the Tweed Heads area where they established the Full Gospel Church. The very first Pentecostal church in South Tweed Heads was known as the ‘Bag Church’ as it was built out of hessian bags. The dream to build the church on their own land remained in their hearts, despite never receiveing the land designated by missionaries for that purpose. 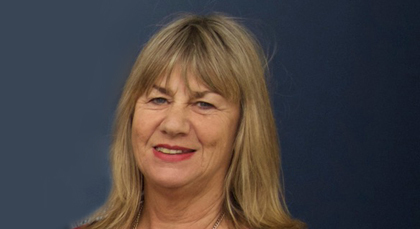 As a 17 year old girl, ACC Pastor Sandra Dumas gave her life to Jesus in the Community Church, and continued to serve God in ministry with her husband, WIlliam Dumas..
“When Pastor Alan Watego went home to be with the Lord, Aunty Amelia Watego continued on the work, praying and believing God would send a man of God to revive the church,” recalls Sandra. In 2001, her husband Will felt led of the Lord to return to the area and in January 2002 became the senior pastor of Tweed Valley Community Church. 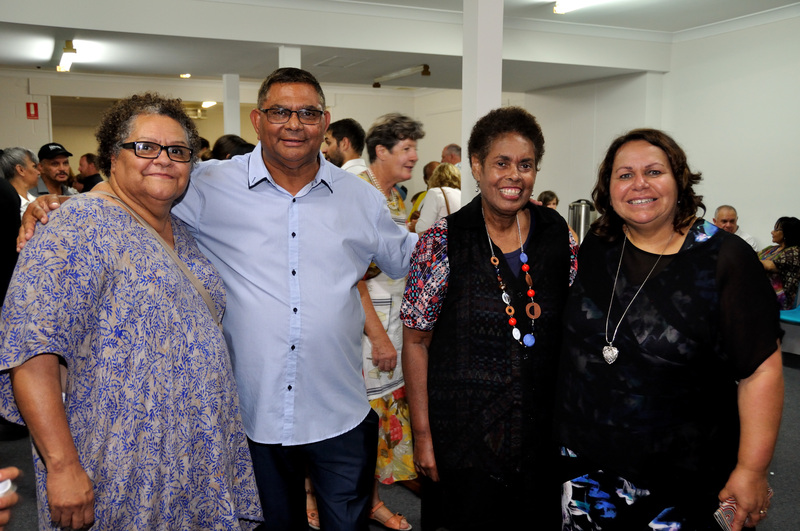 Congratulations to Pastor Will & Sandra Dumas, and the Ganggalah congregation on their beautiful facilities, which will host the ACC Indigenous Youth Conference in September. 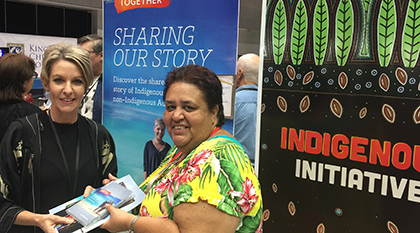 Around 200 delegates visited the National Indigenous stand at this year’s National ACC Conference ‘Take Another Look’ which was exciting and interactive. Our theme was to highlight the beauty and cultural diversity of Indigenous Australia and its peoples. We were also thrilled to be able to place in the hands of everyone we spoke to a free Indigenous Resource kit sponsored by Australians Together. Australians Together is a not-for-profit organisation passionate about ending the disconnect between Indigenous and non-Indigenous Australians through respectful relationships and connections. They exist to help Australians understand our shared story, explore culture and identity and encourage people to discover everyday actions they can take that contribute to a better future for all Australians. That’s why Australians Together produced Sharing Our Story, a free four-episode DVD resource designed specifically for church small groups. It helps viewers discover the shared story of Indigenous and non-Indigenous Australians and understand how the events of our past have affected the lives of Indigenous people in our current generation. Also at conference, the NIF with the assistance of ACCI had a video clip played in the main session, which highlighted the National Indigenous representatives, of which we received great feedback and encouragement from fellow pastors. The ACC National Indigenous Forum (NIF) continues to build on the initiatives to create awareness and engage with the Indigenous people of our nation. Indigenous Credentialed Pastors: The follow reflect the Indigenous pastors credentialed with the ACC. 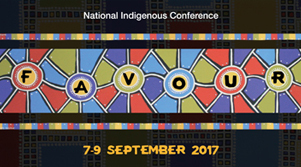 The Indigenous Initiative hosts an annual, national Indigenous Conference with the aim of training, equipping, resourcing, networking and relationship building. The 2015 and 2016 conferences were held in Far North Queensland, with attendances of over 200 delegates per conference. In 2017, the conference will located in Victoria, to further the extension of the conference and create a greater awareness of the Indigenous Initiative and the ACC. To provide a forum where attendees can draw on teaching and group discussion to imagine new possibilities, whether in the context of Church plating or growth of their churches. Identify aspects of teaching and learning that could be improved or made more effective with Indigenous language. Explore the enhancements that could be accomplished through cooperative efforts within our own movement. To lay the groundwork for establishing a collective voice on positive stories and issues facing Indigenous Chris ans. Learn about and de ne the primary hurdles that face each of us as individuals and as part of the various constituencies to which we belong. Form stronger working relationships, both intra- and inter- institutional, built on better understanding of mutual goals and awareness of individual challenges. To introduce attendees to existing ministries and technological enhancements that they may implement at their own organisations. Offer hands-on workshops that provide concrete instruction. The Indigenous Initiative and several other pastors have been supporting the Oenpelli (Gunbalanya ) community -an Aboriginal community in west Arnhem Land in the Northern Territory for over six years. This year we will assist the Leaders in the building of a community church in the heart of Oenpell. Michelle Tamwoy appointed as National Indigenous Representative on the Industry Advisory Group for Alphacrucis. 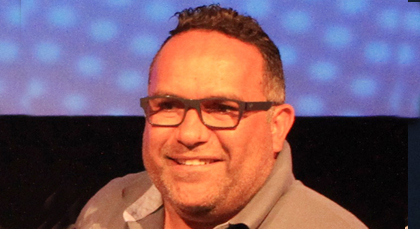 Aaron Wallace appointed as the Regional Leader for the Country North West District & also appointed by the state of Victoria as the new representative for the Indigenous Initiative. National Indigenous Conferences. The steady growth and awareness of who the ACC Indigenous Initiative is. 45 Torres Strait Islander leaders trained in the Safer Churches Workshop on Thursday Island. Establish a cooperative e ort within our movement that highlights a Working Together Partnership. The creation of a Positional Paper: Following the movement’s initiative of developing positional papers on a variety of current issues, the NIF has taken the lead on the development of an Indigenous Inclusion positional paper in conjunction with the National Executive. The focus has been to lay a firm biblical foundation as we journey together in promoting recognition and acceptance of our shared story and healing towards the goal of becoming an inclusive movement of churches which fully embraces indigenous and non-indigenous people alike. Ps Ada Boland grew up in a family of 8 children where alcohol abuse and domestic violence were commonplace. From a very young age she had a strong sense that something was missing in her life, until she had a life-changing encounter with God at age 14. “There was this light coming into my bedroom. There were all these different colours of the rainbow, but the white really stood out. It was God. God actually spoke to me and He said, ‘Ada, I’m here. You were searching for me. You don’t have to be afraid. You’ve been looking for me. I’m here for you,’” said Ada. “So many times we think we’ve got to reach out to God, but He has tried so many times to reach us, through His son Jesus. He came to us. He came looking for me because He saw a desire in my heart that I wanted to know if He was real. From there I had an overwhelming peace and fulfilment in my life,” she said. Ps Ada Boland has pastored several churches throughout Queensland and has ministered globally in 12 different nations. She has worked as a school counsellor with Indigenous youth for more than 15 years. Her father is a descendant of the Kooma people of St George in southwest Queensland and her mother is from the Kamilaroi clan in New South Wales. Ps William Dumas first became a Christian in Long Bay Prison at age 19. “I met a Christian in there, and I couldn’t run away because I was locked up with him. He just started preaching to me. He just kept on telling me about God,” said William. William has now been ministering the Gospel for more than 27 years. He is married to the first female Indigenous pastor to be ordained in NSW through Australian Christian Churches, Ps Sandra Dumas. They have 6 children and 9 grandchildren. “I opened my heart to Jesus and that very moment when Christ became my Lord and Saviour. Drugs, alcohol, everything just began to be totally cut off from my life. When I got saved, God just began to give me purpose,” said William. “The Holy Spirit began to teach me and educate me and I began to have this hunger to learn and have knowledge. When I was in high school, I only went as far as eighth class. From where I come from and where I am today, it’s all because of the power of Jesus,” he said. 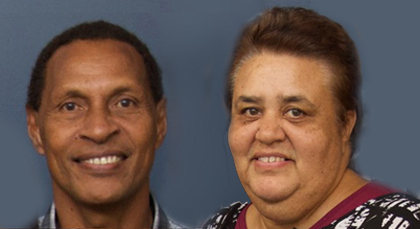 In 2007 William and Sandra pioneered Ganggalah Training Centre with a vision to see Indigenous and non-Indigenous Australians raised up as influential leaders empowered by God. Ganggalah is Bundjulung word, which means a place of learning and wisdom. Over the past 8 years the centre has trained and equipped more than 170 students from across Australia. “It’s a real great privilege to see what the Lord can do to young people’s lives and to see how He can transform their hearts,” said William. William is a Biripi man. He grew up on Biripi country in the Taree and Port Macquarie regions of New South Wales. Dr Esme Bamblett was just 9 years old when American Christian evangelist Franklin Graham passed through her little home church in Shepparton, Victoria. “I believe that’s when I gave my heart to the Lord,” said Esme. “I’ve been a Christian for most of my life. My passion is for the Lord.” Esme is also passionate about family, Indigenous affairs, Indigenous history and Indigenous culture. 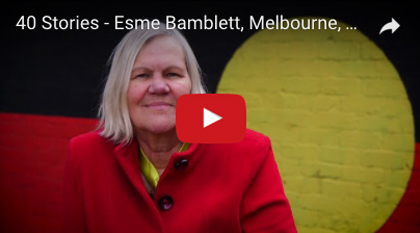 Esme is Senior Pastor at Barak Christian Ministries and CEO of the Aborigines Advancement League. The League is one of the oldest Indigenous organisations in Australia and is primarily concerned with Indigenous welfare issues and the preservation of Indigenous culture and heritage. Esme completed her PhD in Koori Identity in 2010. She has 5 children, 16 grandchildren and 6 great-grandchildren. “I like big families. My mum is one of 14 children. I actually wanted to have 10 children but I stopped myself at 5. All my children are born again Christians. They’ve been reared up in the nurture of the Lord,” said Esme. “I’m a historian. I love history so I like stories. I could tell you a lot of stories about me and Jesus. Me and Jesus, we have a good thing going. He has done so many miracles in my life. He has looked after me and protected me through everything. 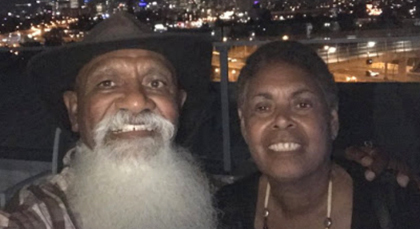 “I trekked to Queensland with my first husband, that’s 2000 kilometres or even 3000 kilometres…1900 miles it was back then. It took 6 days and we never had a cent. We stayed on the side of the road. I prayed every morning for a ride, and we got a ride every day. “I love that Jesus loves me. He loves me unconditionally. He has always been there through think and thin. Even at my worst, Jesus has been there,” she said. Esme is a Bangerang and Wiradjuri woman. She was born in Leighton, New South Wales, and grew up in Shepparton, Victoria. The Bangerang people are from the Murray Goulbourn area. The Wiradjuri People are the people of the three rivers – the Wambool (Macquarie), the Calare (Lachlan) and the Murrumbidgee. Some people believe they have lived in these lands and along these rivers for more than 40,000 years.